Without access to affordable child care, parents may struggle to find and keep jobs or to go to school. Unfortunately, California ranks as one of the least affordable states in the nation based on the cost of child care. Statewide, the median annual cost of care for an infant in a licensed child care center is over $15,000. In a family with two working parents earning low wages, each parent would have to work 147 hours per week to avoid paying more than the federally recommended 7% of income on the cost of child care for their infant. The annual cost of care in a licensed center for older children is also out of reach for many families — $10,200 for a preschool-age child and $5,800 for a school-age child. While prices may be lower with a licensed home-based provider, this option is still prohibitively expensive for families who are struggling to cover basic expenses. 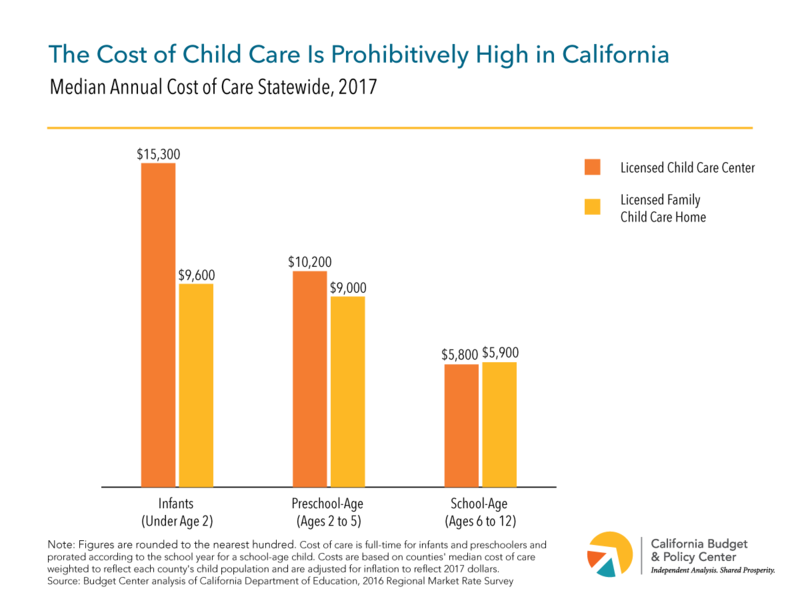 The high cost of care coupled with the large number of children eligible for child care assistance underscores the need for additional state and federal investments in California’s subsidized child care and development system. Child care assistance is critical to supporting low- and moderate-income families while parents are at work or school and is vital to helping families achieve economic security. Providing additional access to child care assistance should be a key component of state and federal budget deliberations. 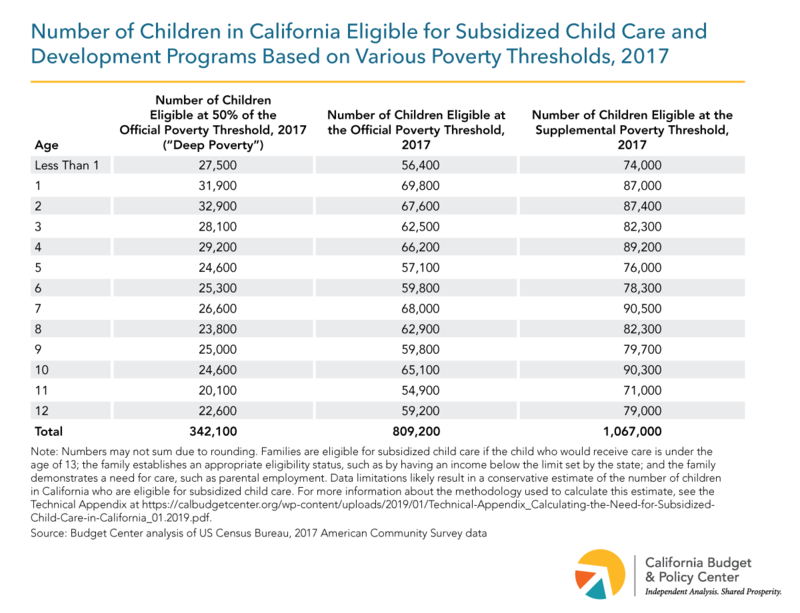 This analysis is the second part of a multiphase effort to analyze subsidized child care and development programs in California. Other phases of this work examine the total unmet need for subsidized child care and unmet need by race and ethnicity. Support for this Fact Sheet was provided by First 5 California. Child Care Aware of America, The US and the High Cost of Child Care: A Review of Prices and Proposed Solutions for a Broken System (2018). The US Department of Health and Human Services updated its guidelines on child care affordability in 2016. Access the final rule at https://federalregister.gov/d/2016-22986. “Low wage” is defined as earning less than $14.35 per hour. See University of California Berkeley Labor Center, Low-Wage Work in California (August 2018). 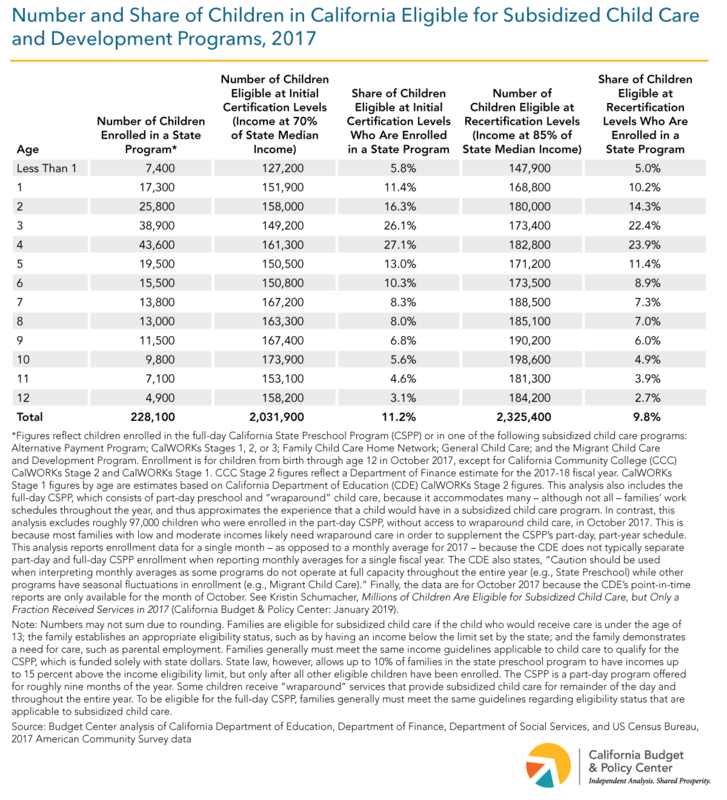 Figures reflect children enrolled in the full-day California State Preschool Program (CSPP) or in one of the following subsidized child care programs: Alternative Payment Program; CalWORKs Stages 1, 2, or 3; Family Child Care Home Network; General Child Care; and the Migrant Child Care and Development Program. Enrollment is for October 2017, except for California Community College CalWORKs Stage 2, which reflects a Department of Finance estimate for the 2017-18 fiscal year. This analysis also includes the full-day CSPP, which consists of part-day preschool and “wraparound” child care, because it accommodates many — although not all — families’ work schedules throughout the year, and thus approximates the experience that a child would have in a subsidized child care program. In contrast, this analysis excludes roughly 97,000 children who were enrolled in the part-day CSPP, without access to wraparound child care, in October 2017. This is because most families with low and moderate incomes likely need wraparound care in order to supplement the CSPP’s part-day, part-year schedule. This analysis reports enrollment data for a single month — as opposed to a monthly average for 2017 — because the California Department of Education (CDE) does not typically separate part-day and full-day CSPP enrollment when reporting monthly averages for a single fiscal year. The CDE also states, “Caution should be used when interpreting monthly averages as some programs do not operate at full capacity throughout the entire year (e.g., State Preschool) while other programs have seasonal fluctuations in enrollment (e.g., Migrant Child Care).” Finally, the data are for October 2017 because the CDE’s point-in-time reports are only available for the month of October. 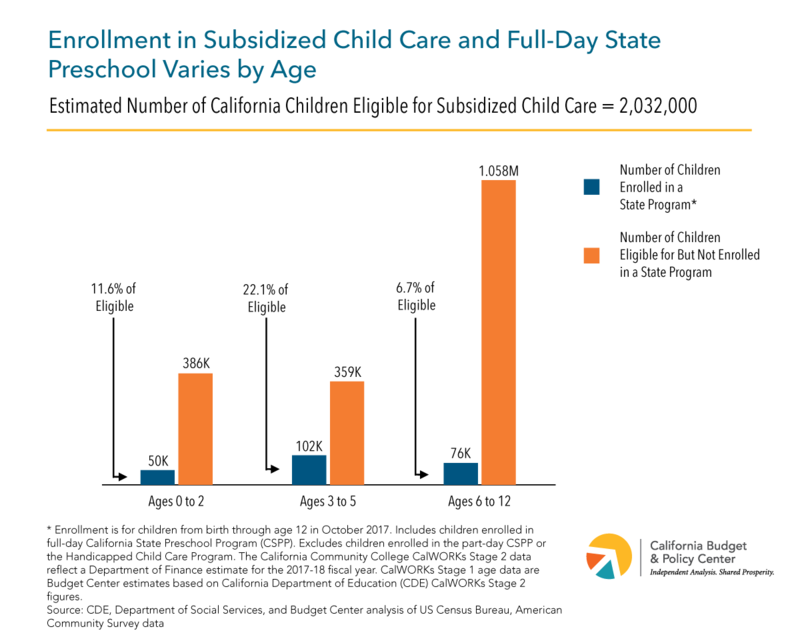 See Kristin Schumacher, Millions of Children Are Eligible for Subsidized Child Care, but Only a Fraction Received Services in 2017 (California Budget & Policy Center: January 2018).